The 2 Day Japan Lingzhi Slimming Formula are weight loss capsules and teas which amongst other contain the lingzhi, a mushroom which is used in the Traditional Chinese medicine and has been associated with a large number of health benefits. The product is claimed to inhibit absorption and accumulation of fat, and eliminate fat in first place from the buttocks, thighs, belly and other problematic areas. 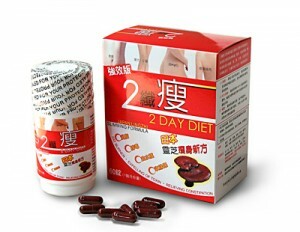 In addition, the 2 Day Japan Lingzhi Slimming Formula is also advertised as constipation relief and body detoxifier. The official website does not provide any informations about side effects nor precautions but some online shops mention that the 2 Day Japan Lingzhi Slimming Formula is not appropriate for pregnant women and people with certain conditions including heart, lung and kidney disease. There are no reports about serious side effects by users either. However, the product may cause adverse effects despite being advertised as all natural. Even natural substances can cause allergic reactions in individuals allergic to any of the ingredients. The official website provides full list of ingredients but these are mostly unknown to Western customers who may have difficulties evaluating whether they are allergic to any of the ingredients or not. In addition to allergic reactions, there is also a risk of drug interaction. Effects of prolonged use of the 2 Day Japan Lingzhi Slimming Formula are unknown as well. The main drawback of the 2 Day Japan Lingzhi Slimming Formula is the fact that neither the official website nor websites selling the product provide any clinical studies or scientific evidence of both efficacy and safety. The official website does provide a full list of ingredients and their health benefits but it is not clear whether the mentioned effects base on scientific evidence or traditional medicine. The official website features a very misleading picture of Dr. Steven Lamm implying that the 2 Day Japan Lingzhi Slimming Formula is recommended by the leading health experts. Its page “doctor recommended” is actually about the statistics of obesity and overweight in the United States and some general recommendations on weight loss and diet pills. The official website provides few testimonials featuring before and after pictures. However, they do not seem particularly convincing. One of the girls from the success stories claims that the 2 Day Japan Lingzhi Slimming Formula helped her lose 45 pounds in one month and two weeks. This is not only very unlikely but very unhealthy as well since she did not look severely overweight in the before picture. Very disappointing is also the fact that there is no satisfaction and money-back guarantee. The 2 Day Japan Lingzhi Slimming Formula may be tempting due to its exotic look and ingredients. But other than that it offers nothing which would set it apart from other weight loss products promising amazing results without any firm evidence. Proactol is better alternative than 2 day Slimming Formula since it is natural, clinically proven to work and there are thousands of customers worldwide. Proactol works by binding dietary fat of your daily appetite. It can bind up to 28% of consumed fat. Proactols proven formula is also featured by top health experts worldwide.